I have only started to read the article by Alberto Guibilini and Francesca Minerva, entitled (risibly) After-Birth Abortion: why should the baby live?, but it is so full of evil I am likely to fisk it at a spare moment. Seriously, it is so bad that it falls into a rare exception to Godwin’s Law. As you might know, Godwin’s law stands as an injunction against comparing anyone or any policy to Hitler, the Nazis, etc. But there is an exception: when they actually sound like Nazis. Although it is reasonable to predict that living with a very severe condition is against the best interest of the newborn, it is hard to find definitive arguments to the effect that life with certain pathologies is not worth living, even when those pathologies would constitute acceptable reasons for abortion. It might be maintained that ‘even allowing for the more optimistic assessments of the potential of Down's syndrome children, this potential cannot be said to be equal to that of a normal child’. But, in fact, people with Down's syndrome, as well as people affected by many other severe disabilities, are often reported to be happy. Nonetheless, to bring up such children might be an unbearable burden on the family and on society as a whole, when the state economically provides for their care. On these grounds, the fact that a fetus has the potential to become a person who will have an (at least) acceptable life is no reason for prohibiting abortion. Therefore, we argue that, when circumstances occur after birth such that they would have justified abortion, what we call after-birth abortion should be permissible. So living with a “severe condition” including Down’s Syndrome is not really in the interest of the person with that disability. But they aren’t willing to endorse killing a full “person” with Down’s but if you can kill a fetus for having Down’s then it is fully justifiable to kill a newborn for the same reason. See what I mean? Its evil stuff. And I actually shivered at the phrase “lives can be expected to be not worth living” given how similar it sounded to the phrase “life unworthy of life” used by the Nazis when justifying first the murder of the handicapped and then later the slaughter of the Jews. In spite of the oxymoron in the expression, we propose to call this practice ‘after-birth abortion’, rather than ‘infanticide’, to emphasise that the moral status of the individual killed is comparable with that of a fetus (on which ‘abortions’ in the traditional sense are performed) rather than to that of a child. Liane: I want to have… an abortion. Liane: Cartman. Yesuh- it's such a hard decision, but I just don't feel I can raise a child in this screwy world. Receptionist: Yes, Ms. Cartman-if you don't feel fit to raise a child, then abortion probably is the answer. Do you know the actual time of conception? Liane: About - eight years ago. Receptionist: Ms. Cartman, uh- eight years old is a little late to be considering abortion. Receptionist: Yes- this is what we would refer to as the - "fortieth trimester"
Liane: But I just don't think I'm a fit mother. Receptionist: Wuh… But we prefer to abort babies a little- …earlier on; in fact, there's a law against abortions after the second trimester. Liane: Well, I think you need to keep your laws off of my body. Receptionist: Hmmmmm. Tsk, I'm afraid I can't help you, Ms. Cartman-if you want to change the law, you'll have to speak with your congressman. So yeah, they are proposing what South Park already parodied... in 1998. I mean that episode had Mrs. Cartman sleeping with various politicians in order to lobby them to change the law, including... President Bill Clinton. That is how old that parody is. Really, words are failing me on this one. 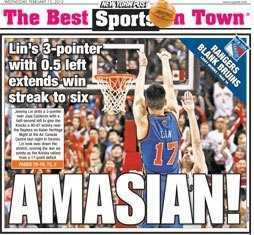 This Cracked article isn’t very funny, but I think for the most part it is pretty insightful: 4 Things the Jeremy Lin Story Reveals About Modern Racism. Actually I think the title is pretty misleading. It is really pretty focused on anti-Asian American racism, and I don’t think most of it is highlighted by the Lin story, but it’s still an interesting perspective from someone who grew up facing this crap. [I]f someone called me a "gook," for example, my immediate gut reaction, before even thinking "racism," would be "THAT'S NOT EVEN THE RIGHT RACE." I know that critiquing the accuracy of a racist joke seems sort of like criticizing the construction quality of a cross being burned on someone's lawn, but in a weird way, someone not even being informed enough about you to use the right slur is a sting in its own right. You want to annoy a Chinese-American? Make some sushi jokes, or kimchi jokes, or maybe even some sweet and sour pork jokes. Apparently not a lot of people know this, but there's a number of dishes that Chinese people really don't eat a lot of, and they're mainly for appeasing the mostly white clientele of many Chinese restaurants. Sweet and sour pork is one of them. If you want to do a "This is what Chinese people be like" joke, you probably want to talk about how they can't get enough of the tapioca tea or something. That'll hit a little closer to home. There is some nits to pick. For instance in modern taxonomy, the Vietnamese are not a separate race from other Asians, but only a separate ethnicity—although it is worth noting that about a hundred years ago, what we call ethnicities they called “races.” So they believed there was a “French” race, an “English” race and so on. …you can’t exactly take criticism of China off the table. What really has to be done is an uncoupling in our minds between an American and their “mother country.” I mean I am almost 50% German, and none of my family spent a day in an internment camp. If memory serves a few Germans and Italians were rounded up, but it was extremely selective, based on things like individualized suspicion and evidence. You know as opposed to our policy with the Japanese, which was to say “frak it” and round up every man, woman and child. With Germans and Italians it was generally assumed that they had broken ties with the “mother country” that indeed now America was their “mother country.” On the other hand, it was assumed that Japanese Americans were still ready to go all kamikaze for their Emperor-God. So if Sea World is Slavery, Then Isn’t This Genocide? Documents published online this month show that People for the Ethical Treatment of Animals, an organization known for its uncompromising animal-rights positions, killed more than 95 percent of the pets in its care in 2011. So strap yourself in, because I am going to get a little philosophical again. Now I confess, normally I wouldn’t care very much about any organization killing lots of animals. While only finding homes for 24 pets is a pretty pathetically low number I can’t say with any certainty that this is an unavoidable result. But when an organization gets so high and mighty as to claim in court that being a trained animal at Sea World is a form of slavery, then it becomes relevant. And it is worth going back to that “Sea World is slavery” argument for a second. In that suit they were seeking, in part, a release of the orcas from Sea World. But is that really in the best interest of the orcas? As background, some students at Lehigh University have estimated that it would be a very expensive project. The steel alone, assuming the Death Star's mass/volume ratio is about the same as an aircraft carrier, comes to $852 quadrillion, or 13,000 times the world's GDP. Is this affordable? Of course the only thing geekier than that discussion is to throw a little real science cold water on it. Hidden in there is a massive assumption: that the materials are the same ones familiar to us. That is when you see something metal-looking, it is steel, when you see something like a glass it is glass, etc. What if instead of glass it is “transparent aluminum” that is used on Star Trek? What if instead of steel it is adamantium from Marvel comics? Or just Rearden Metal? And then at the same time what if the distribution of materials in their galaxy is radically different. What if iron is far more rare, or more plentiful than it is here? And let’s talk extraction, shall we? Surely an advanced alien civilization would have methods of extracting materials very different from our own and presumably more efficient. At least they would be capable of greater efficiency. And then there are labor costs. Which is a great unknown, to tell the truth. Is it going to be humans building it, and is it going to be free labor, or slave labor? In the movie Clerks one of the characters argues that the second Death Star was likely to have the families of the workers on the station, but given that these might all be droids or clones perhaps bred for labor, that is far from a safe assumption (leaving aside the argument that all clones are actually identical twin brothers, thus they are all in a way family to each other). And of course that gets into another variable: freedom. Free labor systems are always inherently healthier and more innovative than unfree ones. Consider one of the most extreme examples: American slavery. In the South American slaves adopted a term “fooling old master” to describe the ways that they intentionally slowed down work on the plantations. Indeed, it is argued that the Emancipation Proclamation might have struck the killing blow to the Confederacy in that it gave the slaves a stake in the contest between the North and the South. There is strong evidence of a severe work slowdown after the proclamation was issued. And one suspects that this was the source of the stereotype that black people were lazy—southern racists misinterpreting such passive resistance. And it is worth noting that this kind of thing happens all over the world. For instance, in the Soviet Union workers became fond of saying “they pretend to pay us, we pretend to work.” I am sure that some in the politburo misinterpreted that as sloth as well. Which is all a complicated way of saying that there are just too many variables to make any kind of an intelligent stab at the truth. And to out-geek the geeks. There was lots of excitable talk last week about birth control, with President Obama dialing back his initial plan for mandating contraceptive coverage to exempt employers who object to such coverage on religious grounds. In those cases, the health-insurance provider, rather than the employer, will be on the hook to pay for the services. And that is B.S. because the provider will then pass the costs onto the customers and employers. Tellingly, health-insurance companies seem quite happy with this compromise, knowing, as they do, that paying for contraceptives is a lot less costly than paying for pregnancies and neonatal care. First, wow. You heard of death panels? Well, apparently she favors “never be born in the first place panels.” What a joyfully misanthropic sentence, arguing that all-in-all its just cheaper if we are never born. And as a point of fact, the insurance companies are not so thrilled about this. Despite the support of a healthy majority of Americans of all faiths, Republican presidential candidate Newt Gingrich inexplicably described the compromise as “even worse” than the original plan. Well, those majorities are only obtained when people are asked questions that greatly distort reality, so again your polling is flawed. And in any case, irrelevant. Is this really a time to try to limit contraception? What about the reckoning of the reality of human lives? Except we are not contemplating a limit to contraception—or the abortion pill, for that matter. No one is talking about prohibiting their use. They are talking about whether to force a group of employers who previously didn’t provide contraception and abortion pill coverage to provide such coverage. So we are not talking about reducing the availability of these treatments, just a failure to increase availability of them. People who cry moral indignation about government-mandated contraception coverage appear unwilling to concede that the exercise of their deeply held convictions might infringe on the rights of millions of people who are burdened by unplanned pregnancy or want to reduce abortion or would like to see their tax dollars committed to a different purpose. And there is what was implied in the last passage laid bare. The right to contraception and the abortion pill in her mind is not merely a right to pay for it yourself, but the right to demand that other people pay for it for you. Okay, then I have a right to a pony. And therefore you must buy me a pony. Now! 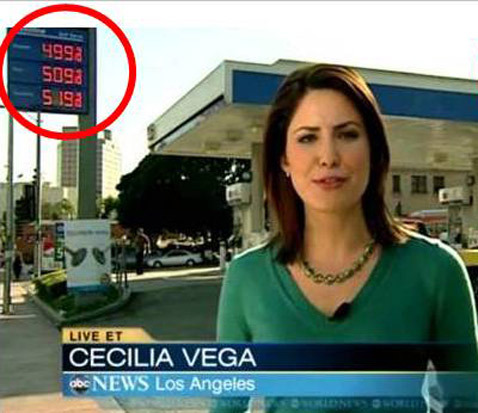 So today we see, via ABC news a report on gas prices where during the report itself they saw the station behind them raise prices by ten cents. 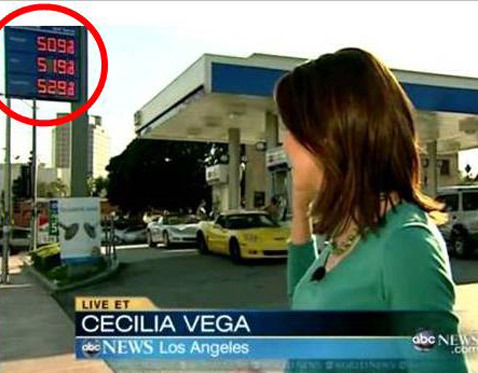 And it is worth noting that the prices are much, much better where I live—at around $3.60 (recognizing that there are daily fluctuations). Normally, I don’t like to pay much attention to Ron Paul. He isn’t going to be the nominee, and his positions on foreign policy are so wildly wrong, it almost doesn’t seem necessary to even take them down. I mean he is the only Republican running who might convince me to vote for Obama. That is how little I like him. But this morning I get a pair of headlines that really illuminate a point about his thinking. First, via Brietbart by way of Weasel Zippers, we have this clip of Ron Paul explaining that the reason why Iran is pursuing nukes is because we are threatening them. The wife of Martyr Mostafa Ahmadi Roshan Behdast, who was assassinated by Mossad agents in Tehran in January, reiterated on Tuesday that her husband sought the annihilation of the Zionist regime wholeheartedly. And it’s pretty repugnant. What does his race have to do with anything? Update: Prompted by a comment by JD over at Patterico's, I have to say this is probably the best way to remember her. What a fabulous voice, and a horrible waste. And as noted in the Washington Post, you can buy a copy of this as a single and the proceeds will go to 9-11 related charities, it seems. We all know what it was. In some way or another, more than likely drugs killed her. I mean feel free to wait for verification, but we all know it. We saw it coming a mile away. I admit I chuckled a little in watching the outrageous clips on The Soup, but part of me felt profoundly sad watching her downfall. I am not saying I am a superfan or anything I am not, but she had a gorgeous voice and for years she seemed like a nice, normal, very “together” kind of woman. She seemed like the kind of person who could be a positive role model to girls everywhere. And now she is a cautionary tale. I admit listening years ago to the Autobiography of Martin Luther King, Jr., had a profound effect upon my thinking. One phrase that stuck with me in particular was this one: “God still has a way of wringing good out of evil.” He said that standing by the grave of three little girls who were murdered by Klan terrorists while attending Sunday school, but it is a phrase that has a broader application. If Whitney Houston died of drugs, that is an evil. I won’t call her evil. I generally try to be a love-the-sinner-hate-the-sin-kind-of-guy. Well, I try. But her death is an evil and a horrible waste. And if there is any good that can be wrung from it, it is as a warning. Drugs took her down. It took this beautiful, talented, classy woman down. And if that convinces one person to quit, or never to start in the first place, then there can be some redemption in this otherwise horrible, pointless end to her life. And I hope Ms. Houston can find peace in the next life. Update: Obama just announced his "compromise" which is pretty much what was predicted and as usual pretends everyone is playing politics, except him who rises above everything. Right. So all week there has been this uproar about the recent ruling that religious employers—like churches or church-based hospitals—would be required to provide “contraception,” a popular euphemism for a set of rules that include coverage for the abortion pill. Last Sunday I was at a Catholic church and just about the entire homily (or “Sermon” to us Protestants) was reading off a letter in protest of this policy. And today we get word of a weak “accommodation” where the religious based employers will not have to provide it in their insurance policies, but the insurance companies would still have to provide it to the policy-holders. So how does that work? Ordinarily insurance works by taking a large number of policy holders’ money and putting it into a pool and then distributing the benefits to policy holders. Instead of that, it won’t be officially offered as part of these employers’ plans, but it will be part of the package of benefits they offer, paid for presumably by the common pool. Which, gosh sounds like exactly the same thing but with the usual governmental layer of red-tape, regulation and bull____. Of course that is only the rumor of the offer, and possibly even a trial balloon, so maybe that won’t be the final proposal. But the funny thing is that I addressed this very issue a few months back and pointed out that this is positively a reason why the Obamacare mandate (to employers or individuals) is unconstitutional. You see very often the argument against the mandate focuses on the idea that the Federal Government doesn’t have the power to force you to buy a good or service. And they are certainly right. But you can say more than just that the Constitution doesn’t affirmative grant the power. You can say that the Constitution affirmatively prohibits the Federal Government from enacting such a mandate. There is also a positive right not to buy a good or service from a private company, in the First Amendment. Wait, this can’t be right... Really? The Phantom Menace? He thinks that is the movie to start off with? Not, say, Star Wars, which now we are all required to call Star Wars: Episode IV: A New Hope? Um, okay. And if that is not enough to annoy the crap out of the fanboys, well, he now is trying to deny history. I mean this may be a generational thing, but remember when you were watching the original Star Wars and Greedo had the gun pointed at Han Solo and Solo keeps him distracted until he could pull out his gun and shoots the guy right then and there. THR: People can get fanatical about the movies — how does that make you feel? The puppet vs. CGI Yoda ruckus, and the who-shot-first, Han Solo or Greedo furor come to mind. Lucas: Well, it’s not a religious event. I hate to tell people that. It’s a movie, just a movie. The controversy over who shot first, Greedo or Han Solo, in Episode IV, what I did was try to clean up the confusion, but obviously it upset people because they wanted Solo [who seemed to be the one who shot first in the original] to be a cold-blooded killer, but he actually isn’t. It had been done in all close-ups and it was confusing about who did what to whom. I put a little wider shot in there that made it clear that Greedo is the one who shot first, but everyone wanted to think that Han shot first, because they wanted to think that he actually just gunned him down. It’s the same thing with Yoda. We tried to do Yoda in CGI in Episode I, but we just couldn’t get it done in time. We couldn’t get the technology to work, so we had to use the puppet, but the puppet really wasn’t as good as the CGI. So when we did the reissue, we had to put the CGI back in, which was what it was meant to be. If you look at Blade Runner, it’s been cut sixteen ways from Sunday and there are all kinds of different versions of it. Star Wars, there’s basically one version — it just keeps getting improved a little bit as we move forward. … All art is technology and it improves every year. Whether it’s on the stage or in music or in painting, there are technological answers that happen, and because movies are so technological, the advances become more obvious. You changed it in the re-release, George. Just admit that. You didn’t like how things would look to kids, so you changed it. Don’t insult our intelligence by saying it was this way all along. Because it is the B.S. involved that annoys me this morning, not the change itself. Strap yourselves in because this is a long one, as I get into some philosophical and moral issues, before I get to the bottom line. So via Hot Air we find out that a Federal Judge has ruled remarkably that an entire class is excluded from the Thirteenth Amendment. Who is this group that has been shockingly excluded from protection from being enslaved and/or subjected to involuntary servitude? Yes, that is right, PETA filed suit claiming that Orcas were protected by the Thirteenth Amendment and therefore Sea World had unlawfully enslaved them and otherwise treated them horribly. You can read the complaint here. I have been trying to locate the motion to dismiss and any opposition to that motion that PETA filed, because that would contain more meaty discussion of the central legal issue—whether the Thirteenth Amendment applies to non-humans at all. But so far I have had no luck finding that, so consider this a bleg. Look, I am not unsympathetic to the idea that at some point a being becomes sentient enough that the law should provide some protections to them. First, I am sorry to everyone for the very light blogging. Mind you, I have been writing up a storm, on my off-time, but most of it is not for public consumption. Maybe someday the whole story will come out, but as I said before, sometimes it is malpractice to share what I know with the whole world. But the subject of today’s entry is not one of those times. Now some people might argue that Brett Kimberlin is reformed. They might say, yes, Brett did horrible things in the past. He is, after all, a convicted terrorist known as the speedway bomber Kimberlin v. White, 7 F.3d 527 (6th Cir. 1993), he was held liable for the death of Carl DeLong, Kimberlin v. DeLong, 637 N.E.2d 121 (Ind., 1994), and Kimberlin is also a convicted perjurer, Kimberlin v. White, 798 F.Supp. 472 (1992), but he has been released from prison and now he has learned his lesson and he would never try to harm another person again. Or so the argument goes. Well, it looks like the reformation didn’t exactly take. You see on January 5, in my opinion, he literally tried to get me killed.